Be the first to share your favorite memory, photo or story of Marilyn . This memorial page is dedicated for family, friends and future generations to celebrate the life of their loved one. Mrs. Marilyn Dohrman, age 90, entered into eternal rest on Wednesday, August 29, 2018 at The Cedars in Madrid. Per her wishes, Marilyn has been cremated. A Memorial Service will be Saturday, September 1, 2018 at 11:00 A.M. at the Schroeder-Reimers Memorial Chapel at Sixth and Marshall, in Boone. A Graveside Service and burial of her cremains will be in the Friends Cemetery in Oskaloosa Saturday afternoon at 3:00 p.m. Visitation will be held at the Funeral Chapel on Saturday from 10:00 A.M. until service time. Marilyn was the daughter of Paul and Eva (Walthall) Johnson and was born on December 4, 1927 at her parent’s home in Oskaloosa, Iowa. As a junior at Iowa State, she and Wayne Eugene Dohrman were united in marriage on November 7, 1947 at the Methodist Church in Boone, Iowa. To this union six children were born, Wayne Jr., Christine, Jeffrey, Lee, Wendy Sue, and Douglas. Her children were her joy and love in life. After her marriage, she worked while Wayne attended winter quarter of school, they then went home to farm the home place in Mount Union, Iowa. She was very actively engaged in the farm operation. Marilyn became a member of the Mount Union Baptist Church where she taught Sunday school for the little kiddies and was pianist for the youth group. She very often was soloist for the church and was active in the Women’s Group. While her children were small she was a Brownie leader, worked with Cub Scouts, and was a 4-H Leader. She was also active in the Eastern Star. She advanced through the chairs to become Worthy Matron and Wayne was Worthy Patron of the Eastern Star. Marilyn and Wayne were divorced in 1983 after being separated since 1966 when she moved to Aplington, Iowa with her children. She became a registered cytotechnologist after attending the Allen Hospital School of Cytology and passing a national register exam. She was employed by Black Hawk Medical Laboratories and then by Covenant Hospital from which she retired in 1987. During her retirement, she enjoyed doing crossword puzzles, needle pointing, crocheting, reading and board games. 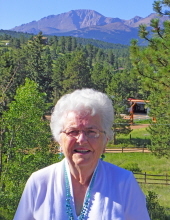 She loved to travel and wintered in Donna, Texas and summered in Woodland Park, Colorado. She is survived by her five children, Wayne Jr. (Barb) Dohrman of Boone, Christine Uhlenhopp of Nevada, Iowa, Jeffrey Dohrman of Buffalo, Iowa, Lee (Mike) Vogt of Lake City, Iowa, and Douglas (Michelle) Dohrman of College Station, Texas; thirteen grandchildren and eleven great-grandchildren. She is preceded in death by one daughter, Wendy Sue; her parents; one son-in-law, Rodney Ruddick; one daughter-in-law, Nola Dohrman; two sisters, Barbara and Pauline and one brother-in-law, Dean Canaday. In lieu of flowers, memorials in memory of Marilyn may be directed to the family. To send flowers or a remembrance gift to the family of Marilyn Dohrman, please visit our Tribute Store. "Email Address" would like to share the life celebration of Marilyn Dohrman. Click on the "link" to go to share a favorite memory or leave a condolence message for the family.